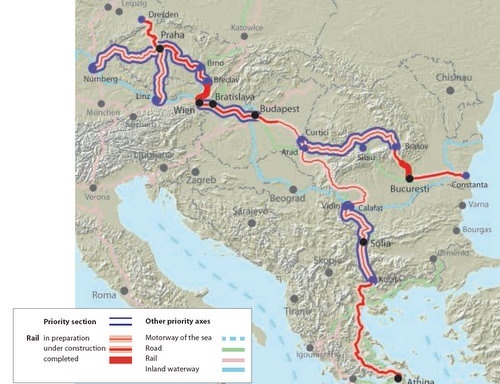 Bulgaria, Greece, and Romania have formally joined the project “Via Carpathia” for creating the shortest transit route from the Baltic to Southeast Europe. Bulgaria’s Deputy Transport Minister Kamen Kichev signed Friday Declaration “Via Carpathia” for the transport route connecting the Baltic states and Poland, Slovakia, Hungary, Romania, Bulgaria and Greece, i.e. the Baltic and the Aegean/Mediterranean. The aim of the declaration is including the Via Carpathia route in the Trans-European Transport Network (TEN-T), an EU-sponsored network of transport routes, in order to stimulate the economic development of the eastern parts of the EU. The Via Carpathia route on Bulgarian territory runs from the Vidin port on the Danube to Kulata on the Greek border via Sofia; it coincides with a section of the Pan-European Transport Corridor No. 4, and the Danube 2 bridge connecting Vidin and Romania’s Calafat is part of it. The bridge should enter into operation some time in 2011-2012, after a decade-long delay. At Bulgaria and Romania’s insistence, two deviations from the Baltic to the Aegean route were included in Via Carpathia – to the Romanian port of Constanta on the Black Sea, and from Sofia to Istanbul via Svilengrad on the Turkish border, and to the TRACECA route to the Bulgarian Black Sea ports. The extension from Sofia to Svilengrad actually covers entirely Corridor No. 4 on Bulgarian territory which runs from Central Europe to Istanbul and Thessaloniki. MAP: Railway axis Athens–Sofia–Budapest-Vienna-Prague-Nuremberg/Dresden, a route included in the TEN-T.